Today I bought a new purse. I bought it from Walmart. I shopped with Baby M today. The purse stayed in the plastic bag until much later. I carried my scruffy scrappy purse with me to drop Baby M. off today for his long-term placement. My friend offered to drive us to the appointment. I usually don’t accept support like this, but today I did. Then she drove me home. Then I went to the school to pick up the girls for choir practice. I took them to choir practice. Then I met Craig for dinner. This was the first time in over a month that we’d had dinner together without any kids, ours or otherwise. And we talked about Baby M.
And I cried very hard some more. And later tonight I dumped the contents of my old purse into my new purse. I still need to organize it, but for now I’ll just keep it that way. 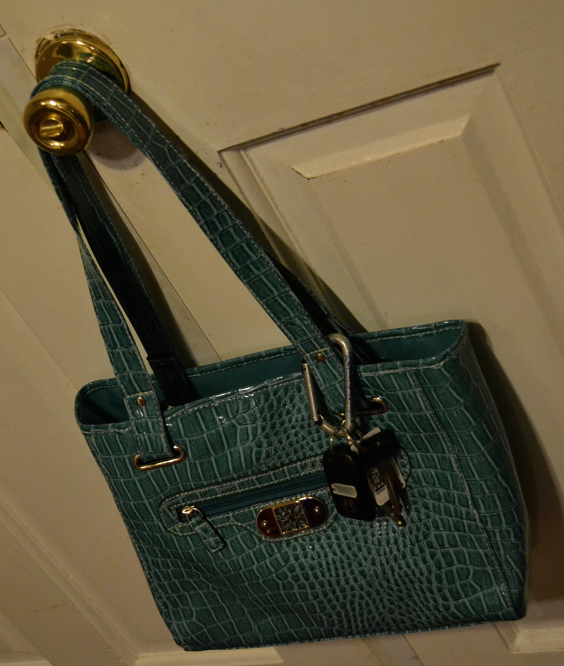 And like I do with everything else, I casualized the purse pronto by clipping my scratched up carabiner to it. And I gathered up all the random baby bottles with less than an ounce of formula still in them and placed them on the counter to be washed out. And saved for the time another baby joins our family for a short season. For now, though, we mourn he who was ours for a little while and pray he is comforted and safe tonight. Heartbreaking previous post. Heart wrenching current post. Our Comforter is faithful.